Make your own homemade chicken skewers with fluffy pita bread and creamy tzatziki sauce with this easy to follow Greek chicken souvlaki ( skewers / suvlaki / suflaki ) recipe! Souvlaki is one of the most popular street foods in Greece and for good reason. It’s stuffed with well cooked and seasoned meat, garnished with a cooling tzatziki sauce, wrapped in a delicious crispy pita and best of all? It tastes like heaven! Souvlaki stands for “meat-on-a-skewer”, however the majority of Greeks and especially those from Athens call any type of pita wrapped meat a souvlaki, specifying the type of meat and method of roasting separately. For example Souvlaki with chicken Gyros or Souvlaki with pork Skewers etc. The most important step in making the perfect, traditional Greek chicken souvlaki is nothing else but the marinade! For this traditional chicken souvlaki recipe, the chicken is first marinated to soak up all the wonderful Mediterranean flavours and then grilled to high temperature, to get all crunchy, nicely coloured and juicy. Select some good quality chicken breasts and season with a selection of Greek spices like oregano, coat with extra virgin olive oil and lemon juice and flavour with garlic. Marinading your chicken souvlaki in the fridge for at least half an hour will allow the aromas to infuse the souvlaki and give it the desired flavours. The best way to serve your traditional Greek chicken souvlaki is nothing other than with some delicious traditional Greek pita. Finding the original Greek pita can be quite challenging as most supermarkets stock only the arabian style ones but you can most likely find them at your local Greek deli or amazon (here and here). However as we all know, nothing compares to home-made, so you can also make your own homemade pita bread with this super easy recipe. Of course tzatziki is the preferred sauce to garnish your chicken souvlaki and we have included one below as well as here. Don’t forget to season with some salt and paprika, sweet or spicy if you like an extra kick. Most Greeks enjoy their traditional Greek chicken souvlaki with some potato chips so feel free to try adding some as well. Oh and you can always read this in Greek if you fancy Λαχταριστό Σουβλάκι κοτόπουλο Συνταγή. To prepare this chicken souvlaki recipe, start by preparing the marinade. Cut the chicken breasts into 2 cm pieces and place them in a large bowl, along with all the marinade ingredients. Use your hands to mix really well, cover with plastic wrap and put in the fridge for 30-60 minutes. In the meantime prepare the tzatziki sauce for the chicken souvlaki. Pour in a blender the olive oil and grated garlic and blend until combined. Remove the skin and the seeds of the cucumber and grate it into a large bowl. Season with salt and pepper and leave aside for 10 minutes. Wrap the grated cucumber in a towel and squeeze, in order to get rid of the excess water. In a bowl, add the cucumber, the blended garlic and oil, the yogurt, 1-2 tbsps of red wine vinegar, a pinch of salt and blend, until the ingredients are combined. Store the tzatziki sauce in the fridge and always serve cold. To assemble the chicken souvlaki (skewers), cut the wooden skewers to fit your griddle pan and soak them in water. (This will prevent them from burning.) Thread the chicken pieces, comfortably, on the skewers. Preheat a grill or griddle pan on a high heat. Cook the chicken souvlaki (skewers) for about 8 to 10 minutes, turning occasionally, until nicely coloured on all sides and cooked through. Alternatively you call grill them for about 20 minutes. 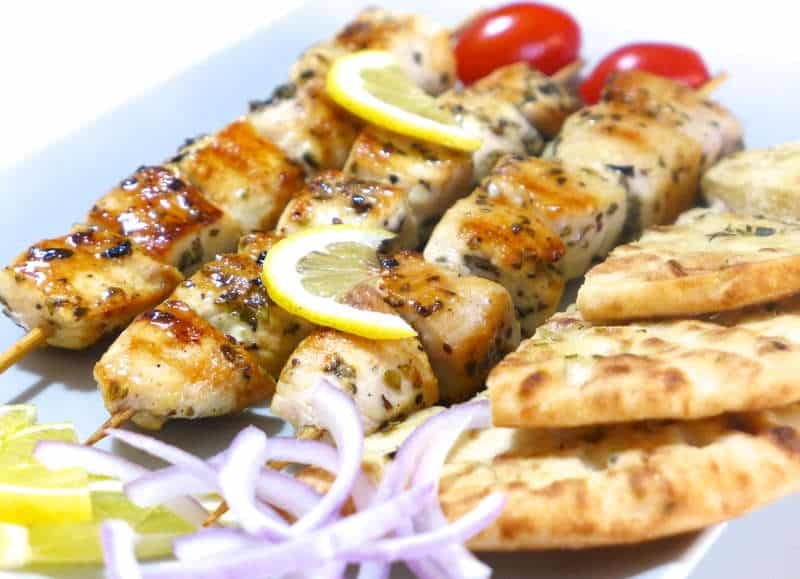 To serve the chicken souvlaki (skewers), slice 2 red onions and place on a platter; top with the chicken souvlaki (skewers), drizzle with some extra virgin olive oil and a good squeeze of lemon juice. Serve while still warm with some pita breads and tzatziki sauce. You can also serve the chicken souvlaki (skewers) wrapped, like a sandwich. Spread some tzatziki sauce on the pita breads and top it with the chicken souvlaki (skewers), sliced onions, tomatoes and fried potatoes and wrap. Enjoy! i can add lemon in the tzatziki.this recipe is great i have try it with baasamic glaze.but without pita. Γεια Ηλί, ποτέ δεν έχω δοκιμάσει Σουβλάκι Πίτα πριν και κάνω σύντομα. Σας ευχαριστώ Eli τόσο πολύ για τη σύστασή σας. πολύ και πάλι. Η αγάπη Διάκονος. Pingback: Homemade Greek Pork Gyros Souvlaki recipe | Yeups | share ＋ enjoy ! Just made chicken souvlaki,Greek lemon roast potatoes and homemade pittas ! It was wonderful ! Thank you ! I’m back in a Greek taverna ! Just come across this website, makes me very happy. Since leaving England, it’s just too expensive to consider a holiday to the Greek Islands which does NOT make me happy. Hopefully these recipies will help to transport me back there – at least my taste buds anyway! For sure it will! Hope you find many dishes that you love and bring back fond memories! And if you need any help drop me a note using the contact form and I’ll come back to you! Delicious! I haven’t done chicken souvlaki before… and this was delicious. Perfect marinade. I use your tzatziki all the time. Its my go to salad dressing and veggie dip. Im addicted!